Organizer Robert “Roman” Haferd and artist Michael Verdon filed the complaint. WASHINGTON, DC – On Thursday, November 10, 2016, Catharsis on the Mall: A Vigil for Healing organizer & lawyer Robert “Roman” Haferd served notice to Robert “Bob” Vogel, Regional Director of the National Park Service, and Hillary Tompkins, Solicitor of the Department of the Interior, for denying organizers their First Amendment right to burn the “Temple of Rebirth” on the evening of Saturday, November 12. 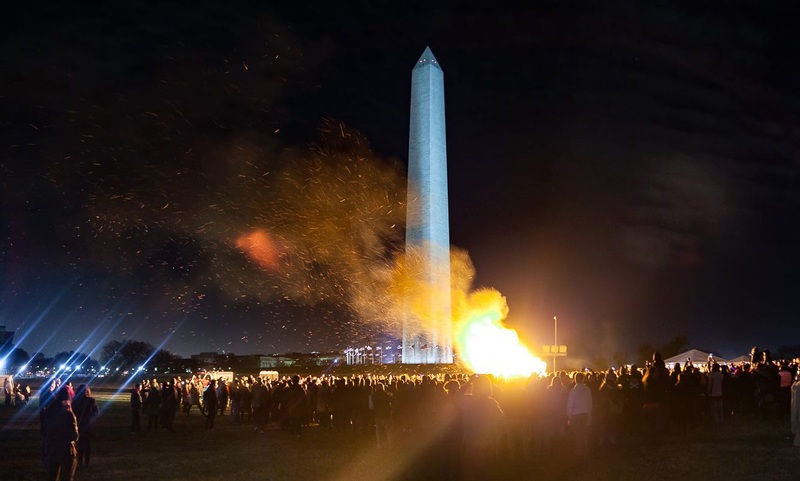 Two weeks after last year’s safe and successful controlled burn of the “Temple of Essence” at Catharsis on the Mall in November 2015, organizers notified the National Park Service of their intention to hold a second Catharsis on the Mall. Nearly 9 months later, in August 2016, the National Park Service drafted and finalized a new policy that limits “bonfires” to no larger than 5’ x 5’ x 5’. Catharsis organizers were not notified of the proper appeal process for the new policy until November 2, 2016. Catharsis on the Mall organizers argue this new policy limits the freedom of expression to an arbitrary size. Given the trauma and separation of the 2016 election, organizers feel that DC residents need this cathartic shared experience now more than ever. The “Temple of Rebirth” is also built to honor, acknowledge and memorialize veterans suffering from PTSD on Veterans Day weekend. While National Park regulations are promulgated through the Federal Register and include the opportunity for the public to weigh-in, National Park policies are not required to go through the same process of public comment. This allows the National Park Service to arbitrarily allow exemptions to some policies, while not approving others. While the speakers, workshops, and cathartic dancing planned for Catharsis on the Mall has been approved and will begin at 11:11am, November 11, the event’s culminating activity, the controlled burning of the “Temple of Rebirth” was denied a policy exemption based on what organizers feel limits freedom of expression and relegates controlled burns of artwork to small bonfires. Catharsis on the Mall is a vigil intended to facilitate seeing and healing for wounds and trauma in ourselves, each other and in our society. It is organized by Washington-area activists and Burning Man enthusiasts, and is supported by Multidisciplinary Association for Psychedelic Studies, Gender Illumination, March for ERA, and many individuals who have donated so much to keep this event priceless. The official event website is http://www.CatharsisOnTheMall.com. Download PDF of this release here.